Cuvette Centrale, as it is known, stores as much carbon as has been emitted by the U.S. over the last 20 years. The peatland ecosystem is home to wetland birds, forest elephants, and western lowland gorillas. Threats to the vast carbon sink include climate change and conversion to agriculture. Laden with carefully thought-out food supplies, Greta Dargie carried her heavy pack as she waded through the mud. 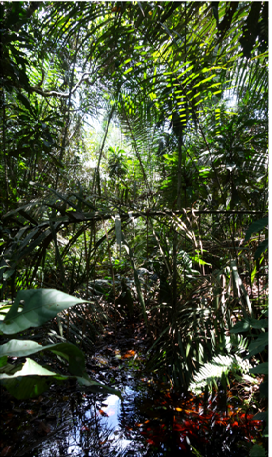 Getting to field sites in the swampy forests of the Cuvette Centrale in the Congo Basin proved no easy task. Dargie and her team travelled by boat down one of the two main rivers of the Likouala region in the Republic of the Congo (RoC). They hiked and waded through water and mud that was sometimes waist high. But they were not alone. These forests are also filled with thousands of lowland gorillas. The UK-Congolese team traveled by boat down river, waded across swampy forests, and camped on soggy ground deep in the forests of the Cuvette Centrale. Underneath this muddy water was a discovery that would have important global implications. Photo credit: Dr. Simon Lewis. 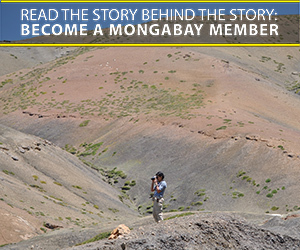 The team’s determination and sense of adventure allowed them to discover the largest peatland in the tropics. It extends 145,000 square kilometers, covering an area greater than England. Dr. Greta Dargie and Dr. Simon Lewis—affiliated with both the University of Leeds and University College London in the UK—led the expedition. They first discovered peat soils in this area in 2012, and spent three years exploring this remote region to determine its expanse. This discovery is not just important for the Cuvette Centrale region: it also has global implications. Peat soils are formed from plant material that is not completely broken down. They are important carbon storage systems—also known as carbon sinks. In their recent study, Dargie and Lewis estimate that it might hold 30.6 billion metric tons of carbon. Dargie likened this number to 20 years of carbon emissions from the United States. They also write in Nature that there is almost the same amount of carbon belowground as there is throughout the entire Congo Basin aboveground. Peatlands only fulfill their role as carbon sinks when decomposition of plant material is slowed or prevented. The waterlogging in these swampy forests helps maintain this role. However, climate change poses a potential threat to this new discovery. If rainfall decreases regionally due to warming, the water in the peatland could drain, ramping up decomposition. If this occurs, release of carbon dioxide and methane – two important greenhouse gases – could increase. “If the peat was to somehow be drained and burned, then the release of the carbon into the atmosphere would be a grave blow to the global attempts to mitigate climate change,” said Dr. Fiona Maisels, advisor for the Wildlife Conservation Society’s (WCS) wildlife survey and monitoring programs in Central Africa. WCS is the Congolese government’s partner in conservation efforts. 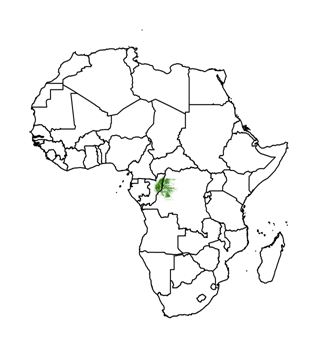 The Cuvette Centrale (shown in green) is an extensive forest and wetland system that spans both the Republic of Congo and the Democratic Republic of Congo on the continent of Africa. Although extremely remote, Dr. Greta Dargie and Dr. Simon Lewis overcame challenging conditions to discover the tropics’ largest peatland. Photo credit: Dr. Greta Dargie. Inside Cuvette Central is the DRC’s fourth largest protected area: Lac Télé Community Reserve (LTCR) covering 4,400 square kilometers. The LTCR is home to a high diversity of wetland birds, and all three Central African crocodile species. This includes two of the most threatened crocodilians in the world – the slender-snouted crocodile (Crocodylus cataphractus) and the dwarf crocodile (Osteolaemus tetraspis). In addition, the LTCR contains among the highest densities of Critically Endangered western lowland gorillas (Gorilla gorilla gorilla) in the region. But how did a peatland the size of England go undiscovered for so long? The Congo River Basin is larger than India. Although researchers believed there might be peat here, they could not find locations mentioned in the scientific literature. “Nobody called the swamp forest in the Cuvette Centrale peat swamp forest, so we needed to go and have a look for ourselves,” said Lewis. Traversing this swamp forest is no easy task: there are few people that venture into it. Furthermore, Lewis noted that peat could only be traversed when it was not submerged at the end of the dry season. Unless you were looking for it, you were not going to find it. The UK team worked with local villagers who knew the forest and were skilled in living in the challenging environment. Accessing field sites required traveling by boat, wading through muddy, swampy terrain, and camping on saturated forest floors. 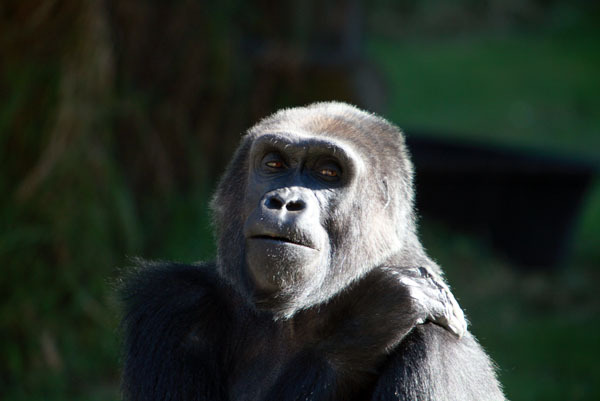 The western lowland gorilla (Gorilla gorilla gorilla) is a critically endangered species living in the wetlands of the Cuvette Centrale. They are found in high densities in the Lac Télé Community Reserve (LTCR). Typically, they reside in drier areas that are not waterlogged, known as terra firme (“firm earth”) forests. Photo credit: Rhett A. Butler. But having an effective team helped in these conditions. Dargie said local expertise was essential. To map the extent and carbon storage capacity of this peatland, the UK-Congolese first collected peat samples. Determining the amount of carbon and the thickness of the peat was integral in estimating the carbon capacity. In one area, the peat soil was 5.9 meters thick – roughly the size of an adult giraffe. Peat consists of semi-decomposed plant material. Decomposition is slower in these ecosystems due the waterlogged conditions. Because of this, peat soils act as carbon storage systems. Hundreds of these samples were collected to determine the extent and amount of carbon present in this peatland. Photo credit: Dr. Simon Lewis. 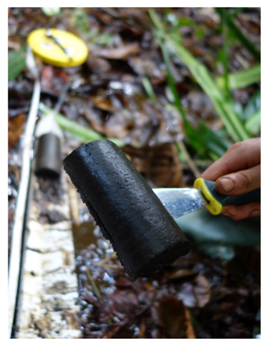 After collecting hundreds of samples, they noticed that the peat is regularly found under two vegetation types: hardwood swamp forests and swamp forests dominated by raphia palms (Raphia laurenttii). The team then mapped these two forest types using satellite data. They needed to figure out how far these peatlands extend within the Congo Basin. The combination of their empirical and satellite data proved that this was the largest peatland in the tropics, and stored some 30 billion metric tons of carbon. Maisels said that the government is considering expanding the LTCR to conserve a larger portion of this important ecosystem. The LTCR is both a Ramsar site and one of BirdLife International’s Important Bird Areas. There are also 27 villages consisting of 17,000 people in or near the LTCR. These villagers depend on the natural resources that this habitat provides, like bushmeat, fish, construction materials, and medicine. Although traditional practices are an important part of their cultures, conservation’s presence helps make sure quotas are maintained. Conversion to oil palm or other agricultural crops could pose a future threat to both the wildlife and the carbon within these peatlands. Such conversions are ongoing in other parts of Africa, and could happen down the line in the RoC if the peatland is not valued as a climate and wildlife protector. Dargie, G., Lewis, S.L., Lawson, I.T., Mitchard, E.T.A., Page, S.E., Bocko, Y.E., Ifo, S.A. (2017). Age, extent and carbon storage of the central Congo Basin peatland complex. Nature, 542, 86-90.